Fluo-8 Calcium Flux Assay Kit (ab112129) is a no-wash, fluorescence-based assay for detecting intracellular calcium mobilization in cells from mammals and other species. In the calcium flux assay protocol, cells are pre-loaded with Fluo-8 which can cross the cell membrane. Once inside the cell, the lipophilic blocking groups of Fluo-8 are cleaved by an esterase, resulting in a negatively charged fluorescent dye that stays inside the cell. Its fluorescence is greatly enhanced upon binding to calcium. If intracellular calcium levels increase, the fluorescence of Fluo-8 is significantly increased. The characteristics of its long wavelength, high sensitivity, and >100 times fluorescence enhancement make Fluo-8 the brightest green calcium indicator available, and it is an ideal tool for the measurement of cellular calcium through HTS screening. This calcium flux assay provides an optimized assay method for monitoring G-protein-coupled receptors and calcium channels using HTS instrumentation. The assay can be performed in a convenient 96-well or 384-well microtiter-plate format. Readers with an in built pipetter are essential for measuring calcium response accurately due to transient property of the calcium signal. Depending on dose of the agonist, the peak response is few seconds to 20 seconds, so one will need to add the compound by instrument and read the fluorescent signal simultaneously every second for ~1-2 min. If you would like to quantify calcium concentration in vitro using cell extracts, we recommend using Calcium Detection Kit (Colorimetric) (ab102505) or Calcium Quantification Assay Kit (ab112115). 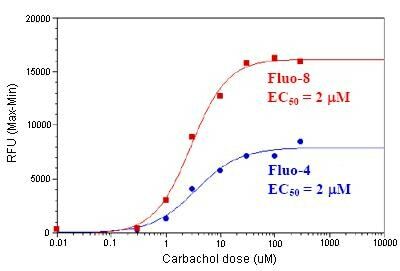 Carbachol Dose Response was measured in HEK293 cells with ab112129 and a Fluo-4 calcium assay kit. HEK293 cells were seeded overnight at 40,000 cells/100 µL/well in a black wall/clear bottom 96-well plate. The cells were incubated with 100 µL of dye-loading solution using the ab112129 or the Fluo-4 kit for 1 hour at room temperature. Carbachol (50 µL/well) was added to achieve the final concentrations indicated. Publishing research using ab112129? Please let us know so that we can cite the reference in this datasheet. The Pluronic F127 Plus component has a red color in the tube, but should have green fluorescence? Is this correct? Thank you for your enquiry by telephone yesterday and for your patience while I contacted the laboratories. They have confirmed that this is correct, the Pluronic F127 Plus component is red in color in the tube. The fluorescence that is read for this assay is green. I recently used the Fluo-8 No Wash Calcium Assay kit (ab112129) on our BMG Clariostar Microplate reader. I could not detect any signal after stimulation of cells. On the FLuo-8 productpage the CLariostar is not in the list with recommended platereaders, while the BMG Novostar is. Is the Clariostar suitable for use with FLuo-8? The only fluorescence microplate readers recommended for ab112129 Fluo-8 No Wash Calcium Assay kit are the ones listed in the protocol booklet. The kit has been tested using the Novostar. Clariostar has everything except the built in pipetter which is essential for measuring calcium response accurately due to the transient property of the calcium signal. Depending on dose of the agonist, the peak response is few seconds to 20 seconds, so one will need to add the compound by instrument and read the fluorescent signal simultaneously every second for ˜1-2 minutes. see the example curve using Novostar on the kit datasheet. If you need to use the Clariostar, we can recommend to try adding the compound (such as control and treatment) one column at a time, and read as soon as possible for a 30 seconds kinetics, and use the highest point see if you obtain anything. However, optimal results would be obtained from the platereaders listed in the protocol booklet which include the in built pipetter (FLIPR™, FDSS, BMG NOVOstar™, FlexStation, ViewLux, IN Cell Analyzer or Arrayscan). I hope this will be helpful. Should you use one of the recommend platereaders and still experience difficulties, please let me know as the kit will be covered by the Abpromise guarantee. UPDATE from manufacturer of CLARIOstar: The CLARIOstar can do FLUO-8 calcium flux, but it can’t screen a plate of agonists like the NOVOstar, only specialized instruments like are mentioned above can do that. The CLARIOstar can do one injection event at the point of measurement. Therefore, it can be used for calcium flux dose response curves by increasing the injection volumes of one particular agonist of interest; or it can be used to look for antagonists, inhibitors, or blockers, which are plated first with the cells and then stimulated with one particular agonist (i.e. epinephrine). The CLARIOstar does require a specific injection ‘spoon’ for simultaneous injection and measurement, which is needed for calcium flux assays. Please contact manufacturer for assistance. What type of plates are recommended for use with this kit? Use black wall clear bottom 96 well cell culture treated plates. does the kit contain probenecid ? customer usually adds it if component is not present in a Fluo-8 based kit, but if it is contained in the kit, he would not add it. Yes, the kit contains Probenecid. No additional Probenecid is needed for the kit. Hello. I am writing about the Fluo-8 No Wash Calcium Assay Kit (ab112129). Mostly, I am wondering if it can be used with my Synergy 2 microplate reader from BioTek. The reader is set up with Ex/Em filters for 485/528, which seems OK, but it does not have a fluid injector. Can the dye be loaded into a 96-well plate using a multi-channel pipette? Do you have other suggestions that may be helpful? The Ca response is a transient response (a couple of the seconds to 10-20 seconds), it is almost impossible to pipette the compounds into the plate, and read the response. Yes, you do use the multichannel pipette to add the dye into the plate, and let incubate for 1 hour at 37C or room temperature. And then add the agonist using the fluid injector within the instrument. and read the fluorescence every second for 90 seconds. You can try a single column a time, and read for 30 second (1 sec a point), see if you can get some response at high dose. Or simply try under microscope, take a picture before the compound addition, and then add compound, take a few pictures see how it goes. Hope it helps. can kit be used with other species than human? Yes, the kit can be used for all the mammalian cells - the lab did confirm this. We are wondering, what makes it no wash? How does one prevent that the cash will fluoresce outside the cells? The kit uses our water soluble and heat stable probeneic to prevent dyes from leaking out of the cells. Thanks for the prompt reply! I looked at other companies that offer Fluo-8 as well and the Kd depends on the chemistry of the molecule. Depending on the derivative it can range from 389 nM to as high as 10 uM, so the 230 nM sounds like it may not be the AM form of the dye, but a different derivative with a higher affinity for calcium. Thanks again! I realize that there was a typos in my last email. The kD value I should have written is 320nm. However I also contacted laboratory after receiving your reply - they have informed me that the kD value is 389nm. I am very sorry about the confusion. Please record 389 as kD value for this product. If this discrepancy in kD value has affected your results, please let me know we can replace the product we have sent. I hope this information will be helpful. Should you have more question please do not hesitate to contact me. What is the Kd value of kit ab112129? It seems that you have asked similar question last year in October and we provided the 230nm as dissociation constant. The 230 nm Kd value is available to us from our collaborator who developed this product for us. Do you think this value does not seem realistic? I can ask the laboratory again if there is any doubt. I will look forward to hearing from you soon. Please do not hesitate to contact us if you need any more advice or information.